Time Guitars • View topic - My Time [AT3 #598] Just missed the fire. Great photos! I don’t recall the year, but after Time Guitars ceased operations, they ran an ad in Vt Times offering guitars, unfinished guitars and parts for sale. I went over to the barn and purchased an Advance Time Three from their rather large inventory of painted, but otherwise unfinished guitars. I believe I paid either $200 or $250 for it. I had to add the hardware, drill holes for the controls and route the slot deeper for the Floyd Rose nut. This gave me the flexibility to lay out the controls the way I wanted. I really wanted a black burst mahogany body Advance 3, but they had none. I still regret not purchasing one particular finished guitar. It was supposedly owned by or built for Johnny Winter. It was an Advance 3 body, but with 2 single coil pickups, a walnut body and a Les Paul type stop tail piece. I hope that it survived the fire. Here is my guitar. The body is either alder or poplar, I don’t recall which. I have Seymour Duncan's in it, a Pearly Gates humbucker and '57 vintage single coils. The guitar is quite light and has a vibrant, lively, resonant, singing tone unplugged. Great job completing your guitar. You have an Alder bodied AT there. Is that a Red or Magenta candy apple? It's hard to tell from the picture. We finally got a good source for Alder from, I think, Oregon. This wood was amazing for it's tone, plus the guitar is really light. Our dealers had asked for this type of guitar and we were selling quite a few. When I left Time, these guitars were in production and I incorrectly thought they had been finished and sold. When Alan & I were with Time we were adamant that no one could buy an 'unfinished' guitar. So this post leaves me a little saddened. But that said, you did a nice good and the guitar looks great. On the Johnny Winter front: Yes that sounds like one of the guitars built for him. He was looking for a strat sound, only the center pickup bothered him when playing. Hence the two single coils. [And less strat-y sound!] That guitar also had large block inlays. Johnny has poor eyesight and he also asked for this. Like all our endorsers, we supplied the guitars for free if they liked and used them. We didn't pay any cash, and couldn't afford to anyways. We built quite a few guitars for Johnny and I remember him as a soft-spoken, thoughtful guy. Of course, on stage, he's a monster! 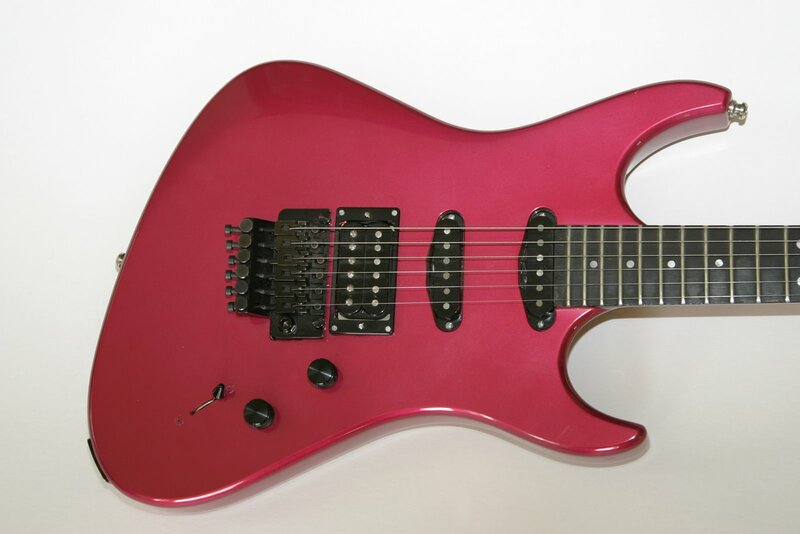 The guitar is the magenta color you mention. The front shots are a fairly faithful reproduction of the color, at least on my computer monitor. The back photo shows as being more red than it really is. When I visited the Barn, I think about a year before it burned, there may have been 20 or 30 unfinished guitars ... some basses, mostly Prime Times and some AT-3s. I was only interested in the AT-3s, at that time, and only had 3 choices that I recall. The magenta, a weird green color, or a combination of the magenta with the front of body painted the weird green diagonally from control area towards the upper horn bout. There may have been a 4th choice that was painted the opposite. That just messed with my eyes too much! When I visited the Barn, I think about a year before it burned, there may have been 20 or 30 unfinished guitars ... some basses, mostly Prime Times and some AT-3s. Wow Mike, that's depressing... Where these guitars in the finish room or just in various states of construction? When we were cranking we usually had over 50 guitars going. As far as the colors go. Tim Schner had free rein on that. I used to argue with him about some of the choices, but eventually let him do whatever. Workplace harmony et. al. I just googled Tim and found him at Gadow Guitars in Durham, NC. Tim Schner @ Gadow Guitars website. You also mention a Black burst AT. Did mean this? This is from the brochure, but it is currently sitting in my living room. I bought it from a guy in Montpelier. P.S. Do you know the serial number on yours? Last edited by ChrisClark on Sun Jun 17, 2007 10:31 am, edited 1 time in total. They were all like mine, finished with no hardware. They just needed rubbing out, holes drillled for components and the FLoyd Rose. I did not see any guitars under construction. I assume it was the finish (drying?) room. They were all hanging. I can no longer recall if there were single or double rows on each side of the room. My memory says double rows, but it could be failing. What I do remember is that there were some basses, more Prime Times than AT3s and that I had several AT3s to choose from... of the various color combos that I mentioned earlier. As to the uncompleted guitars sold, I only recall seeing the ad that I mentioned previously in one issue of the paper. In those days, I always scanned the "musical instruments" section of the classifieds. Perhaps I may have the only one that escaped uncompleted. Or perhaps possibley some ended up in the hands of a builder/repairman to be completed and resold. Purely speculation on my part. There were some completely finished guitars in cases, but I can no longer recall the particular models. I was told most of these were going to be sold with the business if a buyer could be found. I was offered the the Johnny Winter guitar, and one or two other guitars, for a good price, but in retrospect, foolishly I declined. My serial # is AT3-598. The guitar you show from the brochure is the one that I meant by Black Burst ... the shaded mahogany. A note of trivia. I saw an ad from East Coast Sound... back in the day, probably when it was owned by Ed Roman. Of the multitude of guitars in the photo, my eyes locked in on a Prime Time with either a quilt or flamed maple top. I believe this was probably an in house re-top by East Coast Sound. This is speculation on my part because I was told that Time did not make any figured maple top guitars. At any rate, someone out in guitarland owns a very nice looking Prime Time! A light bulb just went off ... could that Prime Time have been from the left over, uncompleted guitars? I know that Ed Roman has bought out small guitar companies like Jaros and leftover, unfinished inventory from other guitar makers, most notably B.C Rich. More speculation. Last edited by mdampier on Tue Jun 19, 2007 12:10 pm, edited 1 time in total. Or perhaps possibly some ended up in the hands of a builder/repairman to be completed and resold. Purely speculation on my part. Perhaps you missed seeing the Wood Curing Room. In there you would have many more unfinished / in construction guitars, body blanks, necks, raw lumber, etc.. 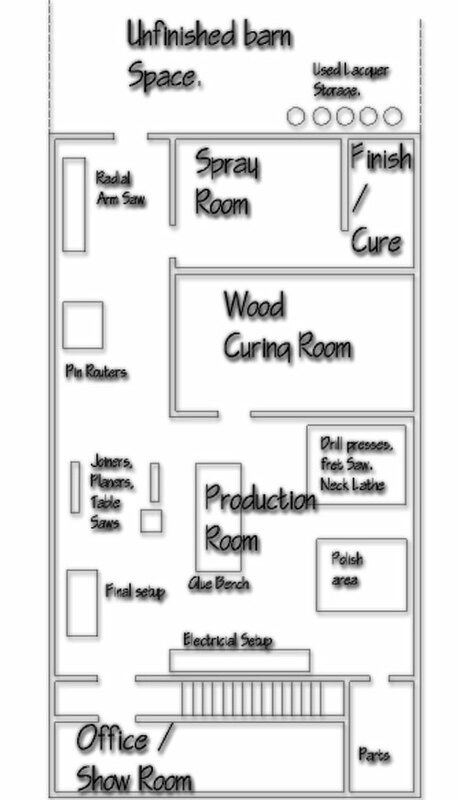 I just did a quick autocad of the Barn Floor plan. The Time Guitar Barn; Second floor layout. The AT/PrimeTimes started at serial# 500. Depending on where your serial number was in the last production run, there could be 67 to 97 completed AT / PrimeTimes in the wild. A Flame top PrimeTime seems like a lot of work, unless they bought the body and neck separately. I have heard that during the fire, the office ceiling collapsed with it's water-soaked insulation and a number of these guitars survived somewhat. The most damage happened around the 'Used Lacquer Storage' area outside the finish room. It was so long ago, but I would say that from your drawing that it was the finish/cure room. I remember that we walked towards the end of the building. I don't recall seeing any guitars in any phase of construction, just the guitars I talked about in previous posts. I probably would have remembered if I had, as curiosity would have gotten the better of me and I would have had to check them out. I was probably just not shown that room. I have only been to East Coast Sound in Danbury once. I remember their ads in the guitar mags, though, as they always had a large number exotic guitars featured in them. When Ed Roman's guitar site came online, he talked quite a bit about building East Coast Sound. Retopping guitars was/is a regular part of his business. Here is a link to a page on his site where you can see retopped Les Pauls, a Fying V, a B.C. Rich, Dean, etc. Last edited by mdampier on Tue Jun 19, 2007 12:14 pm, edited 1 time in total. Thanks for a great thread. Now I need to do all my chores for this weekend before I head out on the road again. Oh! Wait... Is that a beer in the fridge?